how much is the coin worth now? 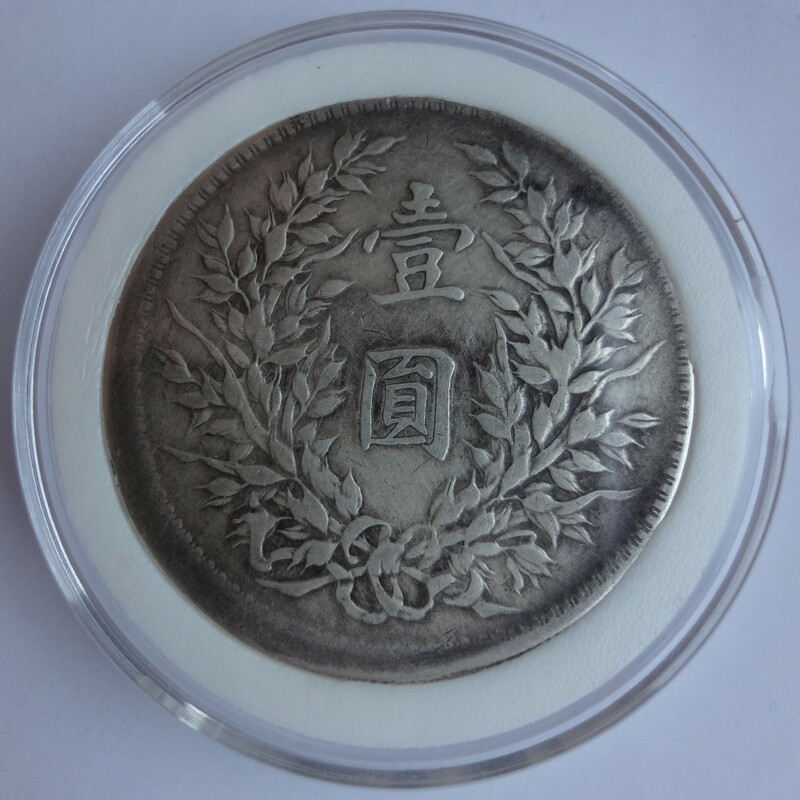 This kind of error coins has a highly variable price, since not so many collectors are interested in them. The lowest price I have seen was ￥5000 CNY (about $800 USD) and the highest ￥9000 CNY (~ $1,400 USD). Hi. 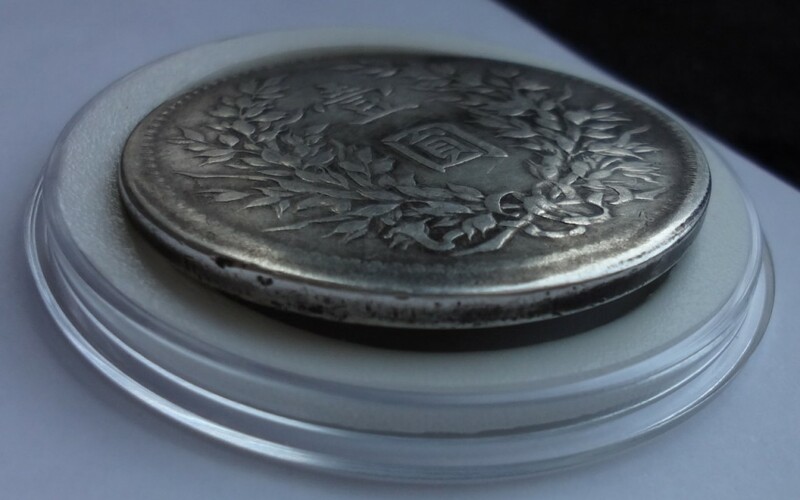 I came across your website, and wanted to thank you for your professionalism and awesome knoweldge of Chinese coins. I know they are hot right now, very collectible, but also there is not much known and tons of replicas. So my late Grandfather left me many coins. I have a fatman dollar, with six symbols above the fatman. My question is this? I would like to send to NGC to get graded, and I know there are like 5 variety’s they recognize. Most of those have to do with the edge, as in reeded, or the T’s, etc. But they (NGC) claims there is a variety that is Y#322.1, a restrike made in 1918 for collectors? The value is considerable for what is a sometime oft common coin. I have attached some photo’s, can you tell me about my coin? Hello, sorry for the late reply! Your coin is indeed a 1914 Yuan Shih Kai dollar. It is in pretty decent shape, but it is not a variety. The 1918 restrike is a rare proof coin, and from the pictures you have linked here your YSK dollar is a business strike. It should receive a good grade, even if I am concerned about what seems to be hairlines on the obverse. You may likely get it slabbed as AU-50 or AU Details: hairlines. Hi, just wondering if you could help me. I have a similar but both sides of the coin have the observe (the man’s side pose). I found that coin in a junk yard and I am not sure whether it’s a minting error or just a replica. There is not chinese letterings or characters on the back apart from what’s showing on the observe. Also the heads on both sides are not medal-turn or both up, if one is 90 degree the other one on the back will be 45 degree approximately. Can you please help me solving the mystery of this coin? Here is the photo of the coin. Hello, unfortunately as users of the China-Mint.info forum confirmed, this is a fake coin. Hello and thank you for your wonderful website. I would be grateful if you could tell me the year of my coin and whether you think it is genuine. It came from my father who would have collected it in the 1950′s. Many thanks. 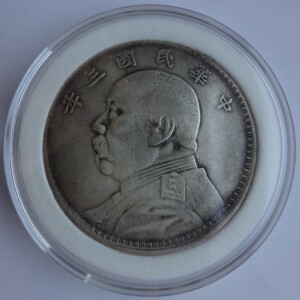 Hello Chris, this is a genuine 1919 Yuan Shih Kai dollar. I have three china “fat an dollars” but they have the face on both sides of the coin. Do you know why this happened? Hello, this kind of mistake appears somewhat frequently on fake coins. I suspect that if you weigh these three coins, you will find them to be lighter than 26.8 grams. After hours of searching for info on the 1914 “Fatman Dollar” with the T edge, I came cross your site, since you have a knowledge on these would you mind taking a look at the attached link to photos of mu “Fatman Dollar”.